●Elitech height adjustable sit and stand desktop converter. It does not need to make any change on your office desk. Just put this desk on top of your office desk and enjoy it. ●Sit and Stand Desktop size: 37.4 In. x 24.2 In. keyboard Tray size: 37.2 In. x 8.5 In. The Desktop is height adjustable from 4.5 In. to 19.5 In. The desktop loading capacity is 35 lbs. The keyboard loading capacity is 4.5 lbs. ●Preset hole on the desk converter surface supports grommet installation of monitor mount. 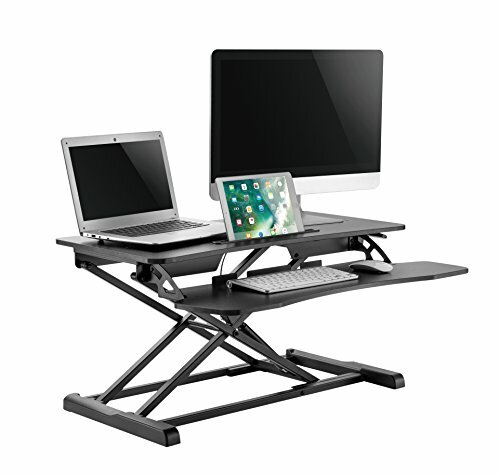 ● The height of the sit and stand desk is easily adjustable, just holding the 2 Squeeze handles to lift it or lower it. Its self-locking pneumatic spring structure provides the smoothest height adjustment to let the desk stop at any level within the range. It will also help to assist the lift and buffer the push. ●The sit and stand desk's 37.4 inches wide rectangular desk top provides enough space for 2 monitors. With the keyboard tray at a lower layer, the desktop layer has enough space left for your accessories. Its front embedded groove on the surface can hold most tablets and phones. This Elitech sit stand desk with an adjustable height provides a working environment for your perfectly comfortable posture. Either sitting or standing, the desktop will fit you well with the adjustable height from 4 In. to 19 ½ In. The Sit and Stand Desk top - 37.4 In. x 24.2 In. keyboard Tray - 37.2 In. x 8.5 In. HEIGHT ADJUSTABLE - Desktop is adjustable from 4.5" - 19.5 In. The desk loading capacity is 35 lbs. Keyboard tray is adjustable from 1 In. to 8.5 In. The keyboard loading capacity is 4.5 lbs. The sit stand desk is design with the concept of simplicity. Adjustment is so convenient by holding the 2 handles. Self-locking pneumatic spring provides the smoothest height adjustment to let the desk stop at any level within the range. It will also help to assist the lift and buffer the push. This desk converter 37.4 inches wide rectangular desk top is space effective. It is adequate for 2 monitors. With the keyboard tray at a lower layer, the table top layer have enough space left for your accessories. The embedded groove on the surface can hold most tablets and phones. The non-skid silicone pads on the desk top protect work surface from scratches or scuffs. If you have any questions about this product by Elitech, contact us by completing and submitting the form below. If you are looking for a specif part number, please include it with your message.